Sir Sahib, a 3YO Fort Larned colt trained by Ian Wilkes, finally got his maiden broken in the 7th career start when he captured at MSW event at Churchill Downs on June 24. He won that day going 11/8 mile over the turf course, getting up at the wire to win by a neck. This one has faced some tough ones in his past — like running second to eventual Fountain of Youth winner Promises Fulfilled in his career debut last September; like beating Mississippi and Zing Zang in career start #2; running second to Arrival in career start #3; like Master Manipulator in start #4. But now that the light bulb has gone off and he is now on the grass, things may go a lot differently. He breezed this a.m. at Churchill Downs, going a half mile in :49.80. That was the 15th best time out of 29 to go the distance. This guy is out of a Dynaformer mare. He may just love the grass. Minit to Stardom, a 3YO Star Guitar filly and a true Louisiana-bred trained by Al Stall, Jr., is well on her way to a brilliant career and maybe stamping herself as one of the best to ever been bred in her home state. She has won three in a row, including an open allowance at Churchill Downs on May 27, when she ran off to an impressive 61/4-length victory over some nice fillies — including the Stakes placed Upset Brewing. She got her third published work since that last race today, breezing 5 furlongs in a snappy 1:00.40, which was the bullet work out of 8 to go that far over the dirt surface at Churchill Downs. Will she run next at Saratoga? I wouldn’t be surprised, and she may she blow the doors off them up there, too. Don’t be mislead LA-bred designation. These Star Guitar progeny can do some running now. Sporting Chance, the talented and sometimes troubled 3YO son of Tiznow, was back on the track at Churchill Downs this morning for trainer D. Wayne Lukas. The colt, who has not been seen in the afternoons since his 6th place finish in the Preakness Stakes, worked 5 furlongs in 1:01 flat, which was the 3rd best time out of the 8. I would be shocked if this one, who has earned over $409,000 in his career to date, doesn’t show his pretty head at Saratoga — the site of both of his career victories and where he won the G1 Hopeful Stakes last September. A return to The Spa may just be what the good doctor ordered. Zipman, a 4YO colt by City Zip and trained by Bob Baffert, is an unusual horse for this barn. To date, this colt — who RNA’d for $340,000 at the Barrett’s 2YO Sale and for $285,000 at the Fasig-Tipton March Sale in 2016 — is a combined 0-3-2 in 8 starts for the top trainer in the world. He worked this morning at Santa Anita, going a half mile in :47.80, which was the 2nd fastest time out of 20 to make the distance this a.m. This one has run three times this year, with two seconds and a third. Close, but no winner’s circle cigars yet. Interesting. Paradise Woods, who set the world on fire and the pundit’s heads to turning after she won the Santa Anita Derby in 2017 in such convincing and over-powering fashion, was back on the track at Santa Anita this morning for trainer Richard Mandella. The Union Rags filly went 5 furlongs in a brisk :59.40, which was the bullet move out of 21 to go that distance today. She is coming off a third place finish to Unique Bella in the G1 Beholder Mile on June 2. She made the early lead against her arch nemeses in that one, but couldn’t keep up the pace. It will be interesting to see what the connections due to this multiple GS winner next. Stay tuned. Tenfold, the mega-talented 3YO son of Curlin and trained by Steve Asmussen, has not raced since running 5th to the grand Justify in the Belmont Stakes. That came on the heels of his spectacular performance in just his fourth career race in the Preakness Stakes, where he ran a threatening third to the eventual Triple Crown winner. He got his first published work since the Belmont Stakes this morning at Saratoga, where he went an easy half mile in :51.31 — which was the 14th best time out of 15. What’s next for this one? 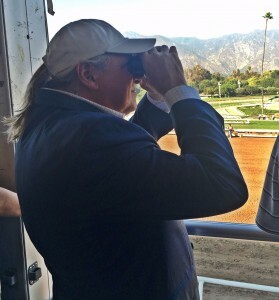 Possibly taking aim at the Travers?